Today’s urban public spaces tend to represent governments and cities rather than people and citizens. In the past seven years, disturbing scenes of protests in city squares have been seen across the Arab world and Europe, but these public protests existed long before the 21st century. So how can city squares support or inhibit protests through their spatial characteristics and settings? Public squares have been considered as places of encounter and exchange since the time of the Greek Agora and the Roman Forum. While often the sites of protest, these spaces also can reflect the idea of power and constrain revolutions and social uprisings. Design and scenography can be used to intensify agoraphobia, or a fear of public spaces. Thus these spaces of expression can, at times, be silenced, putting at risk the geography of freedom of speech. Public spaces around the world have been not only places for people to gather and interact but also to demonstrate and, at times, to face their death. In 2014, Maidan Nezalezhnosti in Kiev was at the centre of the Ukrainian Euromaidan Revolution. It was a deadly revolution of dignity. Yet the consequences of other protests largely attest to how the design of these spaces can intimidate protesters. In 1989, students demonstrated in Beijing during the so-called Tiananmen Square protests, which ended in a massacre. This immense city square of the capital is now known for its “strange emptiness”, as Evan Osnos described it. Benches and shade trees have been removed to discourage public gatherings. "Its totalitarian scale dwarfs the individual and forces people to feel subservient to the power of the state." One can see striking similarities, in terms of scale and setting, with Red Square in Moscow. Red Square had been the scene of the 1968 demonstration against the Soviet invasion of Czechoslovakia, a landmark moment in the Soviet dissident movement. Red Square, Moscow, has been the scene of both public demonstrations and state parades. In Egypt, seven years after the revolution that toppled Hosni Mubarak, people tend to be cautious about expressing their views in public. 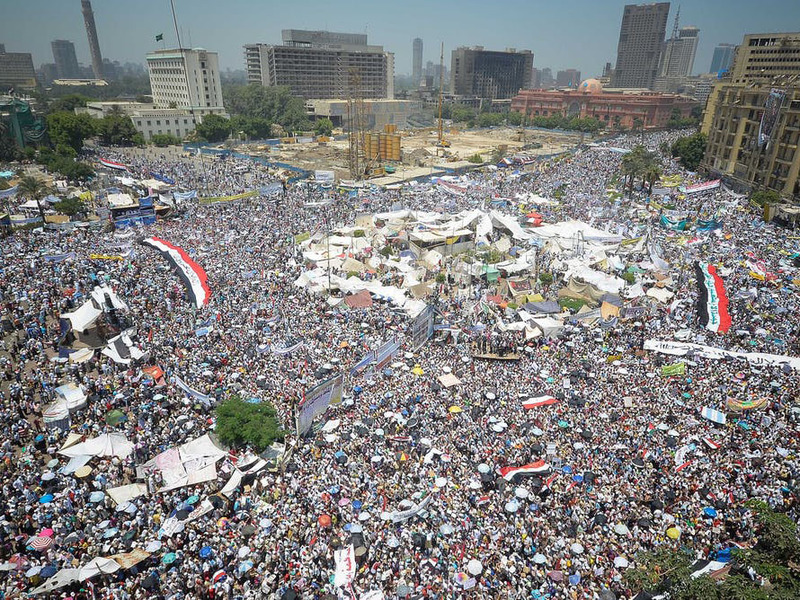 Tahrir Square, the birthplace of the protests, is at risk. Towering metal gates have been erected around the square to avoid protests. These stand as a reminder of the powerful state control that the regime of Abdel Fattah el-Sisi has reasserted over public spaces. Tunisia’s Habib Bourguiba Avenue was the main stage of the 2011 Tunisian Revolution. This public space, considered the historical, political and economic heart of the city, is broad and lined with trees and government buildings, hotels and street cafes. The two paved and heavily trafficked roads on either side of the median strip isolate the pedestrian “island”. This staging of the avenue reflects the power, control and prohibition of protests during 23 years of dictatorship. Other intimidating landscaping elements add to the obstacles for demonstrators who might wish to use the public space for political debates. Despite intimidation through design, Tunis’s layout made L'Avenue, as Tunisians like to call it, the perfect place to stage the Arab Spring. Police and protesters clash in the popular uprising that forced Tunisia’s longtime dictator to flee in 2011. This avenue, planned in the time of French colonisation (1881-1956) for the city’s elite, resembles the Parisian Avenue of Champs-Élysées. Interestingly, even Haussmann’s celebrated Parisian boulevards, built under Napoleon III in the 1860s, were designed to help quell the city’s rebellious populace. Strategically located near the end of Habib Bourguiba Avenue is the Interior Ministry, an icon of dictatorship and control. The “austere” grey facade and black wrought iron windows and gates create a sense of control. Its brutalist architecture, which has architectural similarities with the FBI headquarters in Washington DC, participates in shaping the public space. Razor barbed wire fences have surrounded the avenue during the time of protests. Landscaping around the ministry played a role in blocking protesters from getting closer to the monument of control. Habib Bourguiba Avenue is named after the first president of Tunisia, a tradition for main avenues in Tunisian cities. A simple Google search produces a list of major and small Tunisian cities forced into this autocratic system of political nomenclature as an instrument of control. The image of power and control starts with the name of the place. It continues at the end of the avenue intersecting with the previously known Place 7 Novembre, named after the date of former dictator Ben Ali’s ascension to power in a coup d’état. During the time of dictatorship, architects did not play an active role in shaping social, cultural and political encounters in public spaces. Contemporary public spaces in Tunisia were designed timidly or marginally, creating conflicts between architecture, the local people and the oppressive state. Even green spaces were planned but never designed, as per the planning policies. Many were replaced by commercial centres. Metal fences are noticeable landscaping features around the Ibn Khaldun Statue, small gardens and public parks. The fences turned these spaces into enclosed and sometimes marginal parks. Large propaganda banners of the former dictator added an element of fear to these public spaces and helped deter protesters. The government gated property creates a sense of intimidation and constraint. In designing public squares and avenues, architects should learn from these past dilemmas. The public square should not be represented as the city’s gated property or as a walled garden. It should be a space that provides citizens with opportunities to engage in political and social debates. In the wake of the Arab Spring, rethinking spatial qualities of public spaces is crucial to provide “liberated” citizens with adequate places to communicate their political views and free cultural expression. In Tunisia’s post-revolutionary era, public spaces have increasingly become places for expression and social engagement. Governments, not only in Tunisia but across all countries, should plan the streets for artists and protesters to create stages for their events and to communicate their ideas. Tunisia still has a long way to go.